Pro cestu do Barmy je nutné získat vízum ! Získání Barmského víza je komplikovanější než je tomu zvykem u tradičních turistických destinací. Pro občany ČR je akreditována ambasádsa v Berlíně. Znamená to v podstatě dvě cesty do Berlína. Nemusí tam každý, žádost je možno podat hromadně za všechny. Další možnost je žádat na ambasádě v Bangkoku. Potřebujete k tomu minimálně dva pracovní dny. Nesmí být ovšem v těchto dnech žádný thajský nebo barmský svátek. Pro organizované skupiny existuje možnost získání víza po příletu do Barmy. Veškeré náležitosti (vyjma poplatku za vízum 30,- USD) našim klientům zajišťujeme bezplatně. As information Myanmar tourist visa can be obtained upon arrival for all nationalities at Yangon International Airport and Mandalay International Airport in case you do not have sufficient time to get visa at your country. I would like to mention some detailed information for Visa On Arrival. (1) - Any nationals holding valid normal passport will be issued Visa On Arrival if being accordance with regulations. (2)- Passport of the applicant must be valid at least 6 months starting after the date of arrival. (3)- Visa On Arrival (for Tourist): fee USD 30 ( +10USD/pax for service charges ) will be collected and will be permitted for 28 days. Application for renewal of Stay Permit is not allowed. (4) - Applicant must have a return air ticket to leave from Myanmar. (5) - Applicant must stay in the licensed hotels, Motels or Guesthouses recognized by the Myanmar Government. The exact address of accommodation must be shown. (6) - Those who have place to accommodate such as house of friends or relatives, Industry or Workshop must show the exact address of the host. (7) - Applicant must bring two photos (4×6 cm in size) being photographed within past 6 months. (8) - Applicant must undertake to follow all the existing rules and regulations including Myanmar Immigration ACT. (9) - Children shown on the passport of the parents below 7 year of age will be permitted Visa for free. Children of Individual Passport Holder below 7 year of age will be permitted Visa for free. (10) - Individual Traveler must be able to show at least USD 300 as belonging. Traveler (for Social Visit) must be able show at least USD 600 as belonging. Or Foreign Exchange equivalent to USD can be also shown. 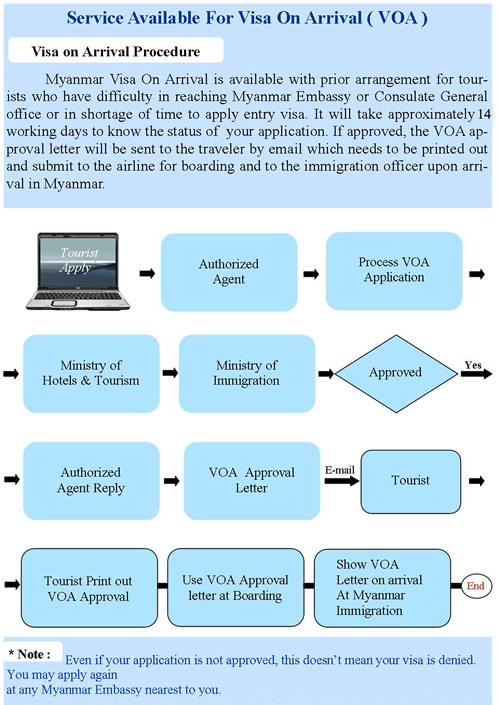 (11) - Applicant must visit by observing the existing Myanmar Visa Regulations. (12) - Unauthorized restricted areas are not allowed. Foreigners must be noticed about restricted areas. (13) - Applicant can get the application form for Visa On Arrival from the airlines or tour agents. Notes : visa on arrival policy can be "suspended" without prior notice .